Clean facility, helpful staff, easy to work with - will use them again if needed. My family and I had been looking for a good storage place, and we are happy that we came across Bear Valley Mesa Self Storage. The staff is always kind and friendly. They make the experience of self storage easy. It is a nice a clean facility, i feel very safe storing my stuff in this storage facility. I would recommend this storage company to anyone looking for a good place with reasonable prices. My family and I have received the best customer service ever from Bear Valley .Michelle and her team are always helpful and go beyond to help us with our storage needs. I am so glad I picked this facility to store my belongings! I never once worried about the security or that my stuff might be in jeopardy. They also give plenty of notices to remind you to pay your rent to help you avoid late fees! The staff is friendly and incredibly helpful. I would recommend this place to anyone! Wonderful facility! The unit I rented is very clean, security is great, and the staff is very helpful and professional. Would recommend Bear Valley Storage to everyone. I been at Bear Valley Mesa Self Storage for a couple months now and i always get treated with the most respect, Great service every time i come in.. I highly recommend renting here. 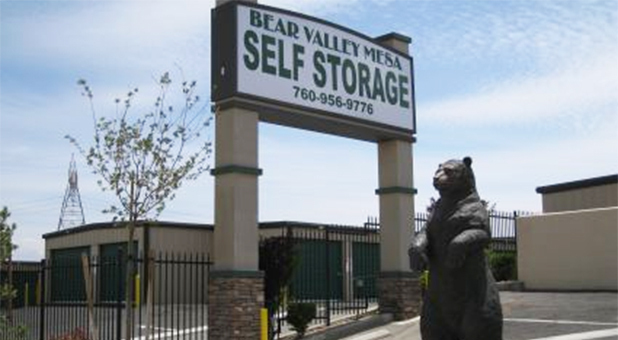 The staff at Bear Valley Mesa Storage is helpful and friendly and the unit is clean, spacious, and close to my home. I am very happy renting here !!! I began to use Bear Valley Mesa self storage in November of 2016. The unit i received was very clean, spacious, and I lucked out in getting a corner unit. Michelle was helpful in getting me setup with the unit and was thorough with the orientation. I recommend BVM Self Storage to anyone. Glad to have found it when it really counted. Great experience fromday one. I was a bit nervous about the security of my personal belongings. However, when I met with the Facility manager Michelle Gregg was very nice and comforting to assure the security of my belongings. This facility is always clean, well maintained and supervised 24/7. I would recommend this facility to many others. I have been renting at this facility for over a year. The staff is very friendly. Michelle, the property manager is very professional. Their are reasonable and they keep their word of rent increases only once a year. Very good customer services, clean, nice,quite, spaces location also inside of the unit was dust free. CLEAN LOCATION, AWESOME CUSTOMER SERVICE,DANIEL (DM) AND STORAGE (MNGR) MICHELLE GAVE ME A VERY GOOD DEAL TO STORE MY ITEMS HERE. Ths is a great storage I have used it a time before this one. They offer a free truck in order to assist with your move! Once you receive your rate make sure to ask if it will change in the furture & if you get all that settled here you will be fine. I was able to get a unit very quickly. The staff was very friendly and helpful. Prices are reasonable, and I would definitely recommend this facility to family and friends. I love the service team of Daniel, Michelle Gregg, and the rest of the staff. They are very helpful, and if you ever go through hard times, they will be willing to help anyway they can. I would recommend this storage facility to anyone. My husband and I truly appreciate the customer service that this facility gives us. Michelle Gregg, the property manager is extremely professional. She is very kind and makes sure we are taken care of. I have never seen a manager keep her facility as clean as Michelle's. She is an absolute professional and awesome person. Daniel Martinez is the district manager. I have never seen a district manager go the extra mile for his tenant's. I don't think I know any person in his position that works just as hard as his employees. You can text, call or email this man at anytime and responds to you ASAP. As long as Daniel is the district manager of this company, our belongings stay at this facility with MIchelle. I have rented a storage on the recommendation of my daughter,who is renting here for 5yrs.Most of all is GREAT customer service.Easy access to your storage,too. I have had my storage unit wth Bear Valley Mesa Storage for 3 months now. They are very friendly and cooperative people. The have great deals and specials and even give out a birthday present to the account holder. Very friendly staff and are very down to earth!!! Great storage facility - clean - secure - helpful and friendly staff. Great Service.... The Staff is amazing. Best prices in town. The facility has always been clean, well kept, maintained and secure. We've never had a problem of any kind, in any way.. and the staff has ALWAYS been most friendly and extremely helpful! Thanks Bear Valley Mesa Self Storage! Storage units have taller ceiling than most. A moving truck is available. Service is great, and prices are competitive. They help make moving and storing stuff easier! I highly recommend this facility, great costumer service and love how they work with you. Thank you guys. Great place to store easy access to street and storage area better than other storage places i have rented from in the past. Bear Valley Mesa Storage in Victorville has been the best I've experienced The physical set-up and location is well kept up, clean, orderly and easily accessed. The staff is always cufteous , friendly and helpful even beyond that. The staff often check on the customer there and offer cold bottled water, hot tea or coffee in the office and usually bowls of candy treats. All supplies needed are readily available for storing and packaging. Especially appreciate that there is on-location staff for safety and survallience . Best I of all, the Bear motif decorates the facility with Mr Bear donning various apparel to reflect the Holidays and Sports events! Delightful!!! NO NEED TO GO ELSEWHERE!! GREAT customer service & reasonable prices...the BEST in Victorville! I highly recommend this facility for your short or long term storage needs. Everything was fast & easy! awesome service thank you all so much. My name is Lora, I would highly recommend Bear Valley Mesa Storage. they are the most amazing and helpful people. The Manager and his staff are awsome, theyare always smilling and happy to help me. Iwant to stay thank you for working with me so i dont loose my things. Tank you for being so understanding.I would never use any other storage. Iwould dend everyone there. Tank you guys for being so nice to me, I have never had such great customer service. Convenient location with helpful and friendly staff..The storage units are very clean and facilities are well maintained with great service hours! Highly recommend! Daniel was very helpful in helping my mother rent a storage place. We appreciate his effort. I came in and needed storage and the Manager Michelle took care of me. She was friendly and helpful. I recommend this facility to anybody looking for storage. They are professional with excellent customer service. Thank you. I have been with Bear Valley Mesa Storage for over 5 years. Lorraine and her staff have always been so nice to me. There has been time, I thought I would lose all of stuff in storage, but they have always worked with me. I truly believe that God placed Lorraine in my life, she always has a caring spirit about her. I have never seen her nor her staff with an attitude. I just to thank you for always working with me and having an understanding heart. I truly appreciate you and your staff. May God continue to bless you all. Thanks Again. Alberta. I am very pleased with your facility and the service received from your staff. The facility is very clean and organized and the staff friendly and very helpful. Our moving day was stressful and took longer than planned; as usual!! lol I had called a few facilities in your area prior to moving day to get price quotes and then came into town prior to moving day to shop for a facility. Yours was the closest to my new residence so I started there. I was so impressed that I didn't look any further. I did not reserve the unit at that time because I had to decide what size we would need. I called back and reserved the unit size I needed and was told to arrive before office closing time, 6pm, to fill out paperwork etc. As I said earlier, moving took longer than aniticipated. By the time we loaded our truck and the 2 hour drive, I knew we wouldn't make it in time to unload that night, but I drove separately ahead of the truck in my car to attempt to make it before the office closed. Traffic, of course, was worse than I expected and I feared I wouldn't make it in time. I called the facility at 5;45 and spoke to Alex. I told him where I was and explained the situation. He said I was close and probably would make it by 6pm, and he said he would wait for me and not to worry and to drive safely. I arrived just at the stroke of 6!! Alex graciously welcomed me and continued very kindly and patiently preparing all the documents and explaining all details, even though I had kept him passed closing time. It was already dark and quite cold outside and I needed to use the restroom. Alex allowed me to use the office restroom, which was very clean, rather than sending me outside to the public restroom. Alex went outside with me to the gate to be sure my code worked on the keypad, and it did. We had to park our full moving truck overnight, as it was too late and too dark to unload that night. We arrived by 8am next morning when the gate access opened and unloaded and were able to return our UHaul truck in time to avoid an extra day of fees. The only things I could say would be an improvement would be having lighting in the units and slightly longer hours. A little earlier in the am and a little later in the pm. Big kudos and thanks to Alex for his kind, professional treatment and service in what could have been an otherwise unpleasant experience. He is a valuable employee and deserves to be treated as such. I will highly recommend your facility!! Thanks for everything, Sheryl C.
To Bear Valley Mesa Storage... I would highly recommend Bear Valley Mesa Storage. Loraine and her friendlyand professional staff maintain a modern highly secured safe self storage facility with multiple sized units within a gated environment to accommodate all your storage needs.